Shinechilla, Other Effect Plug-in from Voxengo. 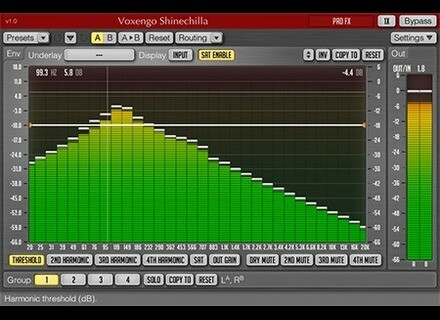 Voxengo releases today Shinechilla, a new effect plug-in dedicated to harmonics generation on Mac and Windows. Shinechilla allows you to generate and blend second, third and fourth harmonics with the dry sound in order to add some coloration to it. Voxengo gives you the ability to adjust coloration for each harmonic on the entire frequency range, and you can independently apply a global distortion. Le plug-in is recommended for use on solo instruments. Shinechilla is available as a VST and AU plug-in for Mac and Windows 32 and 64-bit. It has a special introductory price of $49.95 instead of $59.95 for the next two weeks, and you can download a demo version from www.voxengo.com. Xils-Lab Oxium update and Group Buy Xils-Lab released last week the v1.5 update for its Oxium virtual synth and also launched for the occasion the Oxium Group Buy.